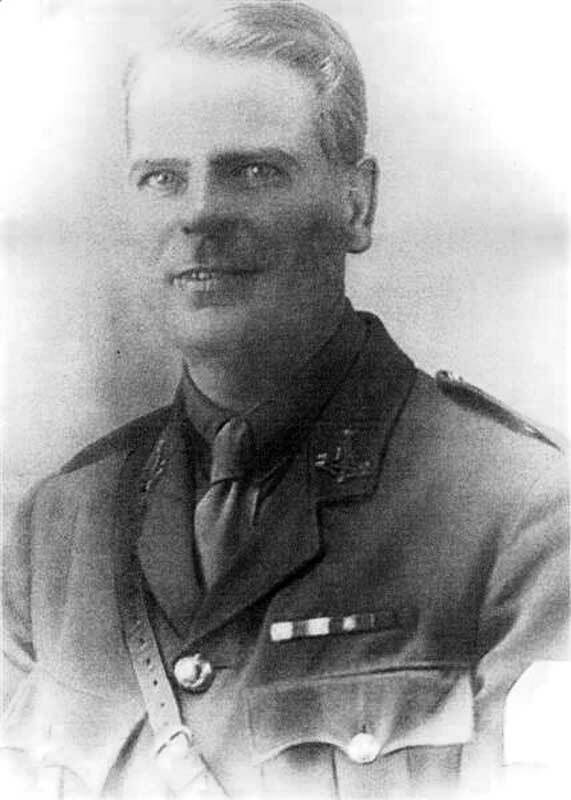 The photograph of Lieutenant Ernest Vivian Fox has been provided by Barrie Bertram (<bhbertram@tiscali.co.uk>), who was researching Lieutenant Fox's connections with the Channel Islands. 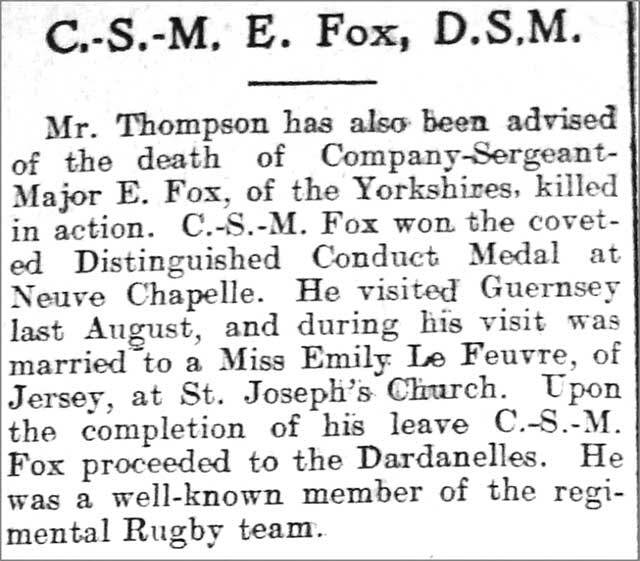 Lieutenant Fox married a Guernsey girl in 1915, shortly after which he was reported as having been killed in action. This was not the case, however, and Lieutenant Fox went on to lead a distinguished career with the Green Howards (see below). The following is taken from M L Ferrar's "Officers of the Green Howards 1688 - 1931". Born at Saltaire, 19th June, 1884, son of Smith Fox, of Saltaire, Shipley. 2nd Lieut., 31st December, 1916, from Warrant Officer ; Lieut. 30th June, 1918 ; retired, with a gratuity, 24th June, 1920. Served with the 2nd Battn. in Belgium and France from October, 1914, to June, 1915, and was present at the battles of Ypres, Neuve Chapelle, Festubert and Givenchy. Was awarded the Distinguished Conduct medal for conspicuous gallantry during the winter of 1914-15. when he frequently made daring reconnaissances of the enemy's position at great personal risk. Served with the 6th Service Battn. from 18th September, 1915, to November, 1916, including the Dardenelles, Egypt and battle of the Somme. Awarded a clasp to the Distinguished Conduct medal for conspicuous gallantry in action. He assumed command of a company, and led his men throughout the operations. Promoted to a commission for distinguished service in the Field. Served with the 7th Service Battn. from January, 1915, to May, 1917, including the Battle of Arras, when he was wounded (15th May, 1917). Was awarded the Military Cross for having, when in command of a bombing party, led his men with great gallantry and determination, driving the enemy back and improving our hold upon the trench. He was badly wounded, but remained in command until the objective was secured. Also in possession of the Russian Medal of St. George, 2nd Class, and the bronze star with clasp. From 21st October, 1918, to 3rd November, 1919, served with the 1st Battn. Nigeria Regt. Served in Ireland during the rebellion.